I want to welcome you to the Village of Loudonville and thank you for visiting our website. My staff and I are ready to assist you at any time and are always ready to provide the highest quality of police and safety service to the community. We hope your visit to our community is a safe and enjoyable one. As you browse our web page, you will see various services we provide to our visitors and residents. We are a 24 hour based operation with a Dispatcher and multiple Officers on duty at all times. Whether you have an emergency or a question, we are available to you at any time. Our goal is to provide the best quality of service to our community. As your Chief of Police, I am committed to the highest standards of accountability along with the most respected and honest communication I can provide to our community. I have a strong desire to work with all members of the public whether you are a visitor or resident. The Loudonville Police Department strives to provide the best quality of life for everyone working, visiting and living within our community. Again, I welcome you to Loudonville. I hope you have a safe and memorable visit. Welcome to Loudonville Police Department’s Vacation House Watch Program. We offer residents of the Village a Vacation House Watch program to provide added security while you are away. Simply fill out the one page form advising of your trip dates and other basic information, and Officers will check your house while you are away to ensure it is safe and secure. Even if you have a residential alarm system, it is to your benefit to use this FREE service. Stop mail and newspaper delivery, or have a trusted friend/neighbor/relative pick it up daily. If you will be away for an extended period of time, find someone to mow your lawn. Use timers for lights, televisions, and radios. Disable and lock your garage doors from the inside. Have a trusted friend/neighbor/relative stop by every few days to make sure the house looks as if someone is still there. Have them water plants/grass, mow, open and close curtains, etc to make the house looked “lived in”. 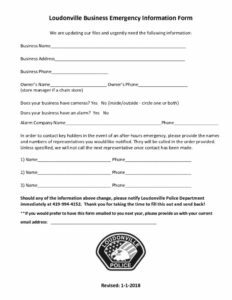 If you are a business owner within the Village of Loudonville, we strongly encourage you to fill out a Business Emergency Information Form. This information is used to contact key holders in the event of an after-hours emergency at your business such as an alarm drop, open door, etc. 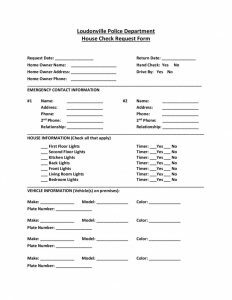 Simply fill out the form attached below with the names and phone numbers of representatives you would like to be notified in this type of situation. We update this information on an annual basis. When the form is completed please drop it off at the station or you may email it to police@loudonville-oh.us. 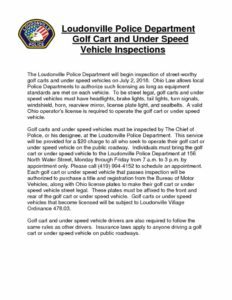 If you are the owner of a golf cart or under speed vehicle that you wish to operate within the Village, you may now have it inspected at the Loudonville Police Department. In order to pass the inspection, the following equipment is required: At least one (1) working rear tail light, at least one (1) light to illuminate rear license plate and make license plate legible from a distance of fifty (50) feet, at least one (1) working brake light, at least two (2) working headlights, one (1) horn, at least one (1) rear view mirror, a windshield (glass or safety glass), directional signals, brackets for mounting two (2) license plates (front and rear), must be equipped with safety belts. Additionally, all such vehicles shall comply with all other requirements established by Ohio law, including, but not limited to, child safety seat requirements. *If your golf cart or under speed vehicle has already been inspected by another agency, titled, and issued Ohio license plates by the Bureau of Motor Vehicles, you will not need to have it inspected here as well. Please view the document attached below for detailed instructions on how to schedule an inspection. 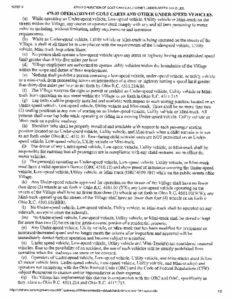 ** Prior to operating your golf cart or under speed vehicle on the roadway please make sure you have read and understand Loudonville Village Codified Ordinance 478.03, Operation of Golf Carts and Other Under Speed Vehicles. A copy of this ordinance has been attached below for your convenience. IMPORTANT: Please remove all the drugs from the pill bottles and/or blister packs, and put them into a single Ziploc type bag. We cannot accept any bottles or packaging. Needles can be taken to the Loudonville Fire Department for disposal. We do not have a Sharps container here and therefore cannot accept them. Please see the attached flyer for how to properly package unused medicine for drop off.